November 10, 2009 (Lakeside) -- The Magic Horse Therapeutic Riding Center hosts an art fair and live auction on Sunday, December 13th from 12:00 noon to 4:00 p.m. at the Lakeside VFW Hall, 12650 Lindo Lane, Lakeside 92040. View the flyer here. The Magic Horse provides life-enhancing differences for disabled people and their families. Owner/instructor Robin Pawl has helpd youngsters make amazing improvements in their abilities to sit, speak, and walk. See our previous article on the everyday miracles occurring at the Magic Horse. 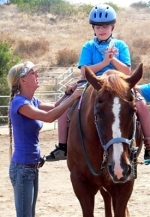 June 10, 2009 (Lakeside)—Once again at The Magic Horse Therapeutic Riding Center in Lakeside, the power of the healing horses and their ability to make life-enhancing differences for disabled people and their families proves successful, as rider Brittany Saber makes huge progress with her strength of mind and determination.